How To Develop Speed For Soccer! In this article I’m going to either introduce or review a specific series of elements to improve speed. Each element can be applied to other team sports as well, however, they will mainly be geared towards soccer and its unique conditions. Below I’ll provide you with each topic followed by a brief discussion. 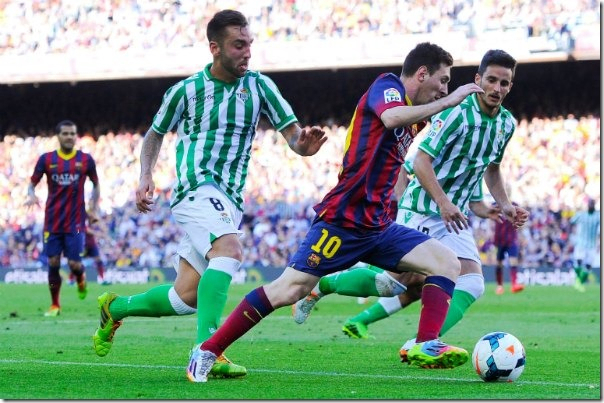 Mechanically speaking, soccer is innately a very “Flexion” dominant activity. Consider the general movement patterns being performed, such as: kicking, ball defending, running, and deceleration techniques, and you will quickly identify that the anterior (front) aspect of the hip structure becomes highly susceptible to overuse. Ailments like hip pointers, IT-Band syndrome, quadriceps strains, Femoracetabular Impingement types (Cam, Pincer, and Mixed) all become very common and almost inevitable unless proper countermovement training is addressed in training. Enter: The Posterior Chain! We all know that sprinters are very hip dominant, but you could make a very strong argument that soccer players should at the very least be balanced through both the front and backside in terms of strength and power output at the lower extremities. If you aren’t familiar with the terminology, then other terms that are synomyous with this category of exercise would be hip dominant work and glute and hamstring exercises. Along with all of the stretching and soft tissue work that should be performed for general and specific hip flexor muscles, drills like Glute-Ham Raise’s, RDL’s, Barbell Hip Trusts, Reverse Hypers, and Sled Work are some of the many variations that should be integrated to help tone down and inhibit too much flexion and anterior pelvic tilt from occurring in soccer players. Not only will you create a better state of symmetry and muscle balance throughout the lumbo-pelvic region, but you will automatically increase acceleration, speed, and power in the process, and who would not want that?! Last but not least, the hamstrings, due to their arrangement across the back of the hip and knee serve as active constraints in the prevention of ACL tears. If the hamstrings are weak as we load and unload our joints in practices or competition then the ACL is left with having to carry a brunt of the stress and work and eventually it becomes compromised to some extent. Regularly implementing posterior chain exercises will naturally provide another very strong safeguard against this very common and catastrophic injury. 4 Tips to Develop Speed for Soccer! Another thing I’ve noticed in the soccer culture from the athletes I’ve worked with is that the “Principle of Specificity” is generally absent as it pertains to speed development. 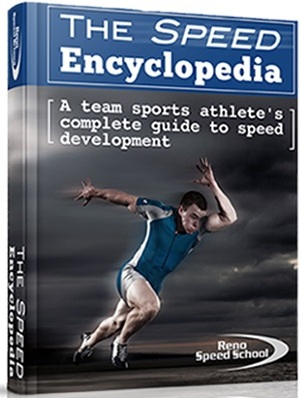 I think it is necessary to note that speed is a general athletic based skill that carries with it its own unique set of rules, principles, and techniques in order to be successful, just like with soccer and every other team sport. The reason I bring this notion up is because it relates with this topic. Players and coaches have a very difficult time letting go of the ball when speed training. Unfortunately, this hurts the enhancement of speed on a number of levels. First, it violates the principle I previously mentioned, but also the “Overspeed Principle.” This principle was originally introduced to me by legendary Track and Field Coach, Charlie Francis. This principle recognizes that in order for specific structures of our body’s neuromuscular system to reset itself to a higher level of speed output, an athlete must operate at a training intensity or effort that is right at or even slightly above their current level of speed. Otherwise the body will not learn, nor be required to adapt to a faster rate of motion. Unfortunately, when you sprint and operate with a soccer ball the level of speed will eventually become to slow to force the specific adaptations (rate coding, rate of muscle recruitment, fast twitch fiber conversion, etc.) essential to speed development due to natural slowing and deceleration. 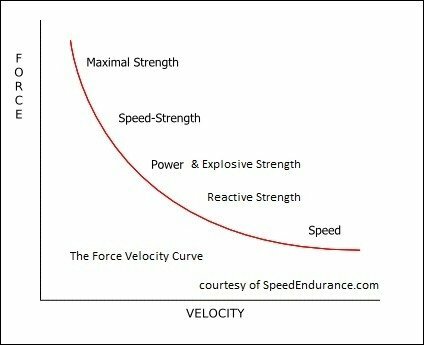 The third issue that I want to discuss is the application of the “Power Curve (aka The Force-Velocity Curve)!” Like many team sports, soccer stills seems to be guilty of neglecting true and proper strength and power training solutions, when they have been found in research to be so effective for building speed. 1 The nature of soccer along with camps and common drills that I witness do a good job of addressing the need for direct speed, but fail to satisfy an equal need for strength and power to maximize a player’s speed potential. I discussed this topic thoroughly in the “Build your Horsepower” series on this site if you want to learn more about the curve’s critical role in getting the most out of your speed training. Along these same lines, I felt it was important to note that muscular hypertrophy or size is another precursor to greater speed and has a dramatic influence on sprinting and soccer speed, contrary to popular belief. 2 Hit the weight room right and forget about those speed myths that muscle makes you slow, or limits flexibility/mobility, etc. 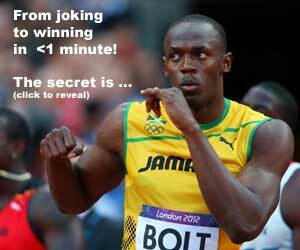 Top Speed Training is the final topic that will be discussed here. This is “Breakaway” ability and is simply defined as the maximum rate in which an individual can move. Track and field has identified a general spectrum of top speed capacity for athletes. Your elite sprinters like Bolt, Gay, and Powell have been reported to reach their top speed at approximately 60-80 meters. High level NFL players who were generally decorated collegiate sprinters will be in the 40-60 meter range, and that puts the rest of us at 20-40 meters. According to this range of speeds, the vast majority of team sport athletes and soccer players will reach top speed sooner rather than later, thus it occurs more often than you might think in competition. Furthermore, top speed will occur in various situations so it should be in a coach and player’s best interest to prepare and continue to develop this athletic quality. There will be both direct and indirect benefits associated with top speed training. Direct in the sense that there are occasions where top speed will occur. The indirect value of top speed training is not so common and understood though, and that is what I want to spend more time discussing now. First, research supports it for improving acceleration and speed across short distances. 3 The specific mechanisms for why top speed work has carryover to acceleration based scenario’s has to deal with the development of the hips (post chain), our muscles’ stretch-shortening cycle, coordination, muscle recruitment velocity and more. All of which will allow our muscles to summon more force into the ground and build power which will result in greater speed! If that’s not reason enough to implement top speed training into your soccer program immediately, check out some of the data I acquired on some of soccer’s elite speedsters. I’ve heard and read various reports that Lionel Messi has recorded a 4.4-4.5 second 40 yard dash. Marvell Wynne recorded a 10.39 second 100 meter dash while in high school, Ronaldo can fly, and Luton Shelton supposedly ran a 4.4 40 meter dash! I’ve always felt that all team sports carry with them their own set of elite speedsters, and the games are played fast as a whole, and soccer is no different. Factor that with the idea that proper speed training science may be lacking and who knows what these genetically gifted athletes and the younger generations could accomplish?! Obviously, track and field is on another level with their performances, but the pro game in any sport is played at an extremely fast level and is a pre-requisite for sport success. Fortunately, speed like any other skill can be developed and improved upon with the right approach and mindset! 1-Ronnestad BR, Effects of in-season strength maintenance training frequency in professional soccer players. Journal of Strength and Conditioning Research 25: 2653-2660, 2011. 2-Weyand, P. Running performance has a structural basis. Journal of Experimental Biology 208: 2625-2631, 2005. 3-Tonnessen E, The effect of 40-m repeated sprint training on maximum sprinting speed, repeated sprint speed endurance, vertical jump, and aerobic capacity in young elite male soccer players. Journal of Strength and Conditioning Research 25: 2364-2370, 2011.